You have no idea how long I had been wanting to find a recipe for these noodles. I was thrilled to find this recipe and to learn that it wasn't going to be that hard to make them. The hardest part of this dish was trying to find the Yakisoba noodles (which really wasn't that hard). I couldn't find them at Walmart and I ended up asking the produce guy at my other local grocery store and he knew exactly what they were. He said they are a new item that they carry. Hopefully, you won't have a hard time finding them. 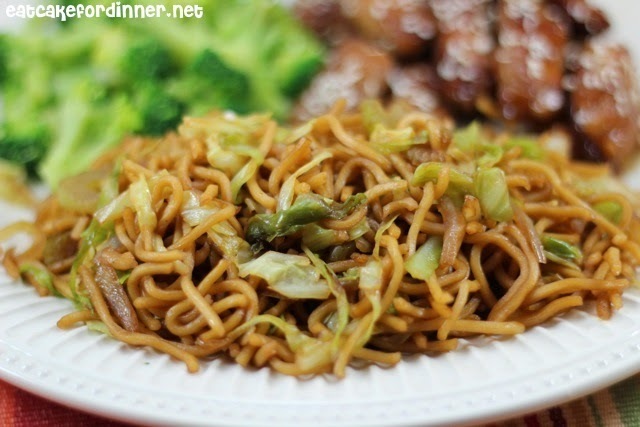 I thought this Chow Mein tasted almost identical to Panda's, which means it is delicious! Panda's doesn't have a ton of flavor, but part of what makes it so good is the combination of all the different textures from the slight crunch of the celery and cabbage to the soft noodles. These are great and I will make them again! Jenn's Notes: It might seem like a lot of cabbage when you add it to the pan, but it cooks down a ton and ends up being perfect. I used Lite Soy Sauce, which has 50% less sodium than regular. Easy and delicious. Really? That's it? Sounds so simple! I have to make this, my 4 year old is constantly asking to go to Panda Express! Thanks for sharing! Did you use chinese cabbage or regular cabbage? Looks delicious and like it will fit the bill for a lighter Chinese dish, thanks for the recipe! Panda Express is my son's FAVORITE!! I may just get an award for "Mom of the Year" when I surprise him with this!! This is a dream come true! I love Panda Express Chow Mein! Thank you!! Pinned! I am soooo making this! Looks delish Jenn! Oh my, I absolutely love their noodles and so want to try this. 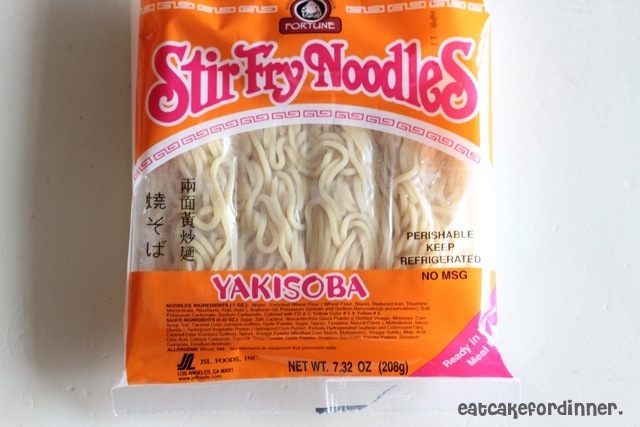 Sure hope I can find these noodles locally! I use Top Ramen noodles because my grocery store doesn't have the ones your recipe calls for and they work great! This recipe is fast and easy, and super delicious!! Great post!! Thanks for the pin and thanks so much for following! I love Chow Mein! You made it looks even better than those in Panda! :) Looks so delicious. Do you know if they carry the noodles at walmart? Yum! This is my husbands favorite thing to order from PE. THANK YOU!!! THIS LOOKS HEAVENLY!!! Will be trying this ASAP! Looks and sounds so good. I love Chinese food. Don't know if I've ever been to Panda before? Thanks for sharing the recipe. Bless you for this! I just need to dig out that Dupe Panda Orange Chicken recipe I have somewhere in the catacombs of my laptop and I can have homemade Panda! Also, I'm hosting a giveaway on my blog (it ends Tuesday) if you'd like to come back by and check it out that would be excellent! I'm pinning this one for sure! Thanks. I can't wait to try this--looks delicious. I can't wait for you to try it too! Looks so yummy! Featuring tonight! Thanks so much for sharing at Mom On Timeout! This looks so yummy! We love cabbage and noodles, I guess it would be more of the Polish version with bacon. But we all love Chinese and this would be the perfect spin on a dish I know we already love! Thank you can't wait to try it! Found this at Six Sisters Stuff! Looks amazing! Yum, I will definitely by trying this! I tried this just yesterday and it was very good! Almost akin to the original Panda recipe! Thank you. Good recipe. I was hesitant since I don't usually like onions, but they were alright after being cooked down. We'll keep the recipe around to have again! if you don't have fresh ginger, can you use ground and how much? Sounds like a keeper to me! To me, ground ginger has a completely different taste than fresh. I highly recommend using fresh and I would probably omit it completely before using dry. If you still want to try dry I read that you use 1/4 tsp. dry per 1 Tbl. fresh. Well, I don't know what happened for me, but after I rinsed my noodles they all stuck together into one big sticky mess. There was no way to separate them again and dinner was inedible. Bummer. I had high hopes for this recipe! Oh no, I'm so sorry this didn't work for you. I wonder why they did that? Did you try and heat them up anyway to see if the heat would help separate them? I'm definitely looking for those noodles at my Walmart! What a great copy cat recipe!! I pinned it to make for my family one night!!! This looks delicious!! :) I have pinned for later! We love this stuff I am pinning this to try sometime soon looks easy and tasty. So I cut the celery too big, i used some of my frozen onion that I keep on hand, I used splenda brown sugar and I put like a whole small cabbage in there, plus I used regular Ra-men noodles which I hate. End result? This is the best thing ever!!! Thank you so much for the recipe I will definitely be doing this again as a side for other Asian things that I have been trying to make. This looks so yummy, but I can't find the noodles. Do you think I could use ramen noodles? I thought the soy sauce was very overpowering the last time I made these and I followed it exactly, I am making it again tonight but with less soy sauce. The recipe was really good. I bought the same brand of noodles(Yakisoba)at WalMart near the Top-Roman. It was not the one shown in the picture. It was basically Top Roman noodles, but it was still delicious. My suggestion is to use Top Roman. Also, lower sodium soy sauce is a must. The salt content is really high and noticeable in taste, but still the taste was delicious overall. Thanks. This was excellent!I doubled the sauce... otherwise followed recipe...very yummy and easy! 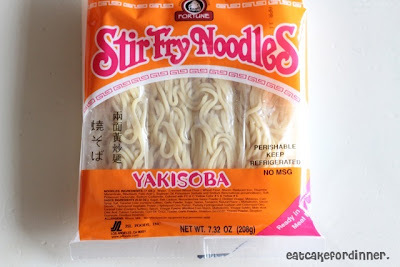 Can I use ramen noodles as a substitute for the Yakisoba noodles? I haven't tried it, but one of my readers used ramen noodles and said it was the best thing ever. You could also use regular spaghetti noodles that have been cooked. I am looking at your banana cookie recipe which is helpful. Chow Mein is a very common chinese food. If you can find SPRING ONION, try it. Just chop the spring onion into small pcs. About 1-2 min. before you think the chow mein is done, throw in the spring onion. Cover up. Cook at low heat for 1-2min. It will smell good. BTW, there are 2 types of soy sauces indeed. One is salty while the other one is less salty and it is darker than the salty one. My hubby and I made this tonight. We used lo Mein noodles that I had in the pantry, purple cabbage, and we added some chicken. So delish! Love that I can make one of my favorite things at home now with real food ingredients and satisfy my prego cravings! Win win win! I'm so glad you liked it - thanks! This is delicious, Better than Panda's in our opinion! I have made this for my family & guests multiple times! Affordable, fresh & soo good! We pair it with an orange chicken and veggie egg rolls---> Perfection. Thank you for sharing this gem with us! That is so good to hear! Your egg rolls sound fabulous. Thanks. I'm eating this right now and it's amazing! I paired it with Bubbly Nature Creation's orange chicken. Yum! Also, I found the noodles in my local grocer's dairy/deli aisle, with the egg roll wrappers. They were called Hot & Spicy Yakisoba, but the sauce came in a separate packet. I make this all the time and swear its as good as what I used to get at Panda !!!! I've made this a few times now, but with carrot instead of cabbage; also never with yakisoba noodles, but it's really the sauce I enjoy anyway. So good, thank you for sharing!